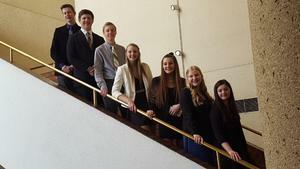 Thornapple Kellogg High School was represented by seven students at the state Business Professionals of America state convention and competition last weekend. We would like to apologize and alert everyone that the recent edition of the “The Key” has the INCORRECT athletic schedule for the spring sports season. It appears to have been printed with last year’s schedule. Please pass this message along to others and encourage them to go to TKAthletics.com for the most updated schedules and game times. Here is the schedule that should have appeared. Please note this schedule is also subject to change. The best place to get the latest sports schedule and changes is to visit TKAthletics.com. Thank you. 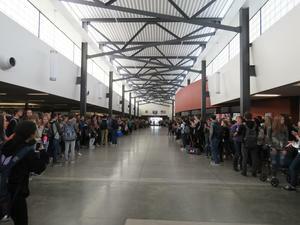 With the band playing the school fight song, students lined the Main Street hallway in the high school applauding five student-athletes who are competing at the state level this weekend. Carly Snyder will represent TK in bowling; Alex Fabiano in swimming; and Christian Wright, Nathan Kinne and Trenton Dutcher in wrestling. Good luck TK athletes! 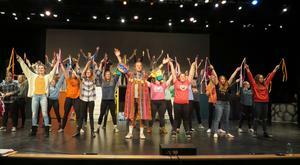 TKHS presents "Joseph and the Amazing Technicolor Dreamcoat"
The Biblical story of Joseph and his coat of many colors comes to life as the Thornapple Kellogg High School students perform "Joseph and the Amazing Technicolor Dreamcoat" March 7, 8, and 9. Performances are at 7 p.m. in the high school performing arts center. Tickets are on sale now and can be reserved. An order form can be found at www.tkschools.org. Cost is $5 per student and $7 per adult. Senior Citizens living within the TK district are invited to attend a free showing of the dress rehearsal starting at 5:30 p.m. March 5. 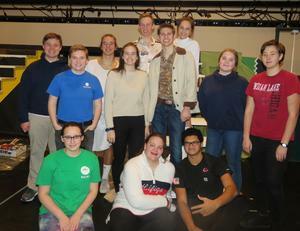 This production, directed by Laura Nikkel, involves a cast of 45 students, student musicians and many additional student and adults working behind the scenes. This is a truly timeless Old Testament tale set to a multitude of musical genres, spanning from country-western and calypso to bubble-gum pop and rock and roll. This is a family-friendly show appropriate for all age levels. Thornapple Kellogg High School senior Jack Schneider played the role of "Charlie" in "Willie Wonka Jr. " when he was in fifth grade. In the same year, classmate Grace Hauschild played the role of "Violet" who blew up into the giant blueberry and another classmate, Katie Dinkel, was the "Candy Man." 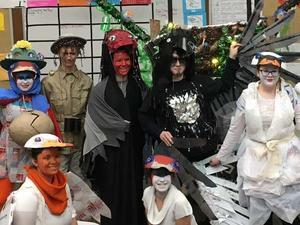 In all, 10 Thornapple Kellogg Odyssey of the Mind teams will advance to the state finals, including both high school teams each receiving a first-place honor in their divisions at the regional competition. 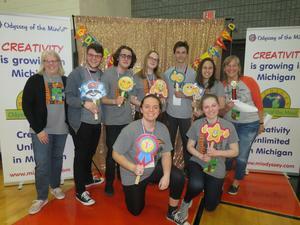 In addition to the top regional honors, one high school team earned the coveted Ranatra Fusca Creativity Award at the regional competition. This award represents the essence of Odyssey of the Mind. Team members are Jacob Maring, Emma Chapman, Grace Densham, Zane Walters, Clair Jansma, Anna Miller and Wyatt Crampton and coached by Barb Maring and Mary Chapman. The other high school team advancing is made up of team members Aubrey Evans, Christel Hoskins, Kelly Gasser, Brendan Carlson, Michael Brown and Ellie Essenberg. The team is coached by Michelle Essenberg and Rebecca Hoskins. TKHS senior Grace Hauschild has been selected as a member of the All-State Choir for the third year of her high school career. Hauschild will be a member of about 120 high school choir students from all over the state making up this select group. This is the highest of honors and an amazing achievement for someone to be selected for three years! The All-State Choir will perform at the Youth Arts Festival in May at Western Michigan University.